The best flooring for your space, lifestyle and budget! Larsen Carpet is a second-generation, family owned business, offering a large selection of flooring products, both in stock and special order! Stop in and work with us to find the product that can take care of all your flooring needs. Our professional, in-house personnel can walk your through the design and then can provide expert installation. Creating a feeling of warmth and comfort to any room, elegant or casual, carpeting is one of the most affordable floor coverings available today. Performance, options in colors and texture, and styles for any home or office make carpeting the right choice for any project. Natural solid wood or engineered wood offers warmth and beauty in a classic, timeless look. The use of hardwood in your home will highlight your other design elements well when you choose to invest in this flooring type. With a wide range of finishes, its durability and ease of maintenance, Hardwood flooring is an excellent choice for any project. Considering vinyl for your home or business? This easy to clean, durable flooring is the top choice for high-traffic areas. Flexible and stylish with more choices of patterns and colors than ever before, vinyl remains a popular choice. Today’s vinyl combines luxury, cushioned resilience and affordability for any flooring need! Today’s luxury vinyl features some of the most innovative, versatile, and high-performing flooring available. LVT offers the richness and texture of more expensive natural materials, such as hardwood, ceramic tile, and stone, without maxing out your budget. Offered in tile, plank, and sheet formats, this flooring boasts easy installation, and a high level of comfort with a soft step. This high quality long lasting flooring option is a great choice for your project. Today’s laminate flooring options combine realistic looks with carefree maintenance. The wide range of design choices, affordability and durability options make this flooring a #1 choice in high traffic areas and active households or business offices. Get the look of excellence at a great price! Tile is a fashionable and practical flooring option with natural looks, beautiful designs and long lasting durability. Available in a number of finishes, sizes, colors and shapes, there is no limit to the personalized designs you can create during your decorating experience. 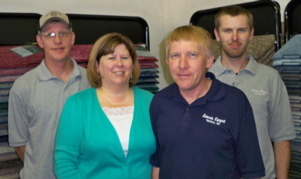 Larsen Carpet was founded by Richard and Mary Ann Larsen in 1972 and is still going strong today. Steve and Kim Larsen, the current owners made it a second-generation family business when they became owners in 1995. You can usually find Kim in the store providing personal service and Steve on site handling installations. Rounding out their true family team is son Matt, who has been doing installations for over 12 years, and brother-in-law Joe, who has been doing installations for over 20 years. Larsen Carpet is a 4-time “People’s Choice” award winner and with so much experience you know they can handle any flooring job. Let us know what your flooring needs are! © 2019 Larsen Carpet. All Rights Reserved.